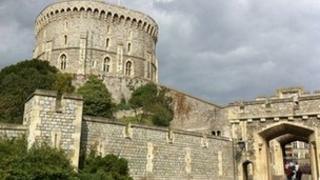 A hydropower station on the Thames in Berkshire is generating enough power for Windsor Castle and more, according to the director of the scheme. The Romney Weir turbines are "spinning like crazy", producing 200 to 300 kWh, Southeast Power Engineering director David Dechambeau said. A Royal spokesman confirmed the castle was buying energy from the company's subsidiary, Romney Hydro Power Company. The Royal household has a 15-year contract with the firm. Mr Dechambeau said the amount of energy produced was dependant on river conditions - too high or too low water meant the plant was less efficient. He said: "At the moment we have perfect conditions. Right now we are producing 200 kWh, meaning the whole castle is being powered. "They have become so efficient that they don't use much energy at night so some is going back into the grid." But the Royal spokesman said: "The plant is providing a proportion of the castle's daily requirement but it is too early to say what proportion that will be over the course of the year as the demand naturally varies between winter and summer. "The project is still in its infancy so it is too early to assess the size of the carbon emissions saved." The two giant Archimedes' screw turbines were installed in December 2011 and testing began in April. Mr Dechambeau said: "There are no more major stages to go [but] we're improving it all the time. "I'm so happy to see it after all these years of working on it - we are pretty pleased at the moment." The scheme included the installation of an 11,000 volt cable connecting the system to the castle. The project should have been completed in 2012 but was delayed after complications forced Southeast Power Engineering to rethink where the cables should be installed. The multimillion-pound scheme is anticipated to produce enough to power to supply 600 homes.